Red Hill Birding and Illinois Audubon Society are pleased to offer an exciting field trip to beautiful southern Illinois, May 8-11, 2019. We plan to explore the southern part of the state in search of both migrants and southern breeders. Warblers, flycatchers, vireos, and shorebirds will be passing through and breeding birds will be busy getting nesting season underway. 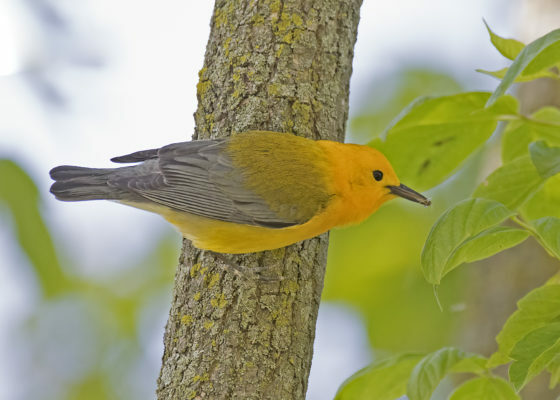 We will hope to find breeding warblers like Prothonotary, Prairie, Yellow-throated, Kentucky, and Worm-eating along with many migrants; southern Illinois specialties like Mississippi Kite, Black Vulture, Fish Crow, and Chuck-wills-widow; wading birds like Snowy Egret and Little Blue Heron; and of course much more. With stops in the Cache River Wetlands, Union County Conservation Area, Cypress Creek National Wildlife Refuge where we’ve arranged access to the Bellrose tract, and various spots in Shawnee National Forest including Cave Valley and Oakwood Bottoms, the birding is sure to be superb and this short trip will provide a thorough introduction of this wonderful part of the state. The trip cost includes three nights in the Super 8 in Anna, Illinois; meals from breakfast on May 9 through dinner on May 10; transportation in a group van; an expert guide from Red Hill Birding; and all entrance fees. The trip will begin with looking for nightjars and owls on the evening of May 7 and will end with a farewell dinner on May 10 (lodging on the night of May 10 is included).